When Hurricane Sandy hit New York in late October, Cohn & Wolfe's New York office, home to over 200 employees and the company's headquarters, lost power for a week. In the weeks following, Cohn & Wolfe organized multiple outlets for employees looking to lend a hand. Whether through supply drives, financial donations or good-old-fashioned manual labor, employees came together to support those who needed it most. Since immediate material goods were required in hard-hit areas, the NY office organized donation drives for communities that were especially in need. For residents in Breezy Point, employees brought in everything from batteries to blankets and pillows. In the Staten Island region, which was still in the large-scale process of cleaning debris, boxes were loaded up with cleaning products, along with clothing donations in all sizes. 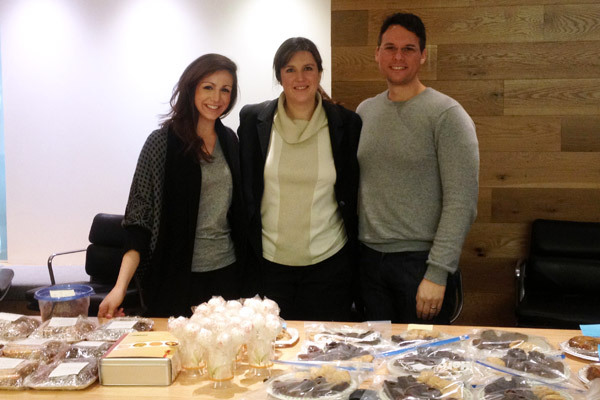 Recognizing that many New York employees have talents in the kitchen, Cohn & Wolfe organized a bake sale, with all proceeds benefiting the Sandy NJ Relief Fund. Employees answered the call with everything from homemade donuts to savory cornbreads. At the end of the day, we raised more than $1,000 for those in need. The most recent highlight of our ongoing relief efforts was an employee trip to the City Harvest packing center in Long Island City. The team stuffed 700 bags, weighing in with a whopping 6,040 pounds of food. The donated goods were shipped off to shelters, soup kitchens, and food pantries hit hard by the storm.